After listening to It's That Episode with Craig Rowin, I'm actually frustrated that I did not have the idea first. As someone who obsesses over retro television shows and the details, this is a dream. 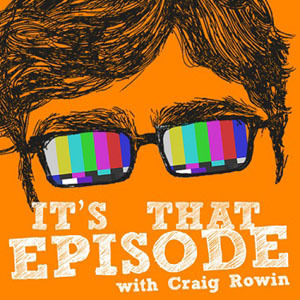 The premise is simple: host Craig Rowin invites a fellow comedian (this is a podcast after all; comedians to podcasts are like moths to a flame) to watch an episode of a television show of their choice. The episode may be chosen because it is their favorite, it's entertainingly bad, or anywhere in between. And thus is the reason I love talking about pop culture: it represents the time it came from, it tells us a lot about the zeitgeist and most about why people identify with it. Craig does a great job of getting the guest to talk about their lives when they first saw the chosen episode and how it influenced them. When it is an obscure episode (the episode about Hey Dude was on my list of top podcast episodes of the year), it creates a sense of connection to the conversation because you hear details about a show you haven't heard in years. Shows watched include Magnum P.I., Fraggle Rock, Family Ties, Ren and Stimpy, and my personal favorite, Studio 60 On The Sunset Strip. Damn, I wish I had thought of this idea!